Being an island with quite some history, the name of Tinos comes from its first settler, Tinos, or is derived from the Phoenician-Summerian word “Tannoth” which means reptile. Other names that are attributed to the island are “Ydroysa”, (because of the many running water springs) and also “Ofioysa”, because the island was in the past home to a lot of snakes. Neptune was considered to be the protector of Tinos, who in order to protect it from the snakes that plagued it, sent a flock of seagulls to hunt them down. As most excavations have revealed, the island was inhabited both during the Copper Age and throughout the whole period that the Cycladic civilisation existed in the region. From ancient times till now, the island has been renowned for its marble. Also stone sculpting flourished there throughout the ages. The island is has been inhabited from the earliest years. Its first residents are presumed to have been Phoenicians or Pelasgians and later Ionians. Mycenaean tombs have been discovered on the island, whereas a great part of the findings are dated to the Geometrical Age. 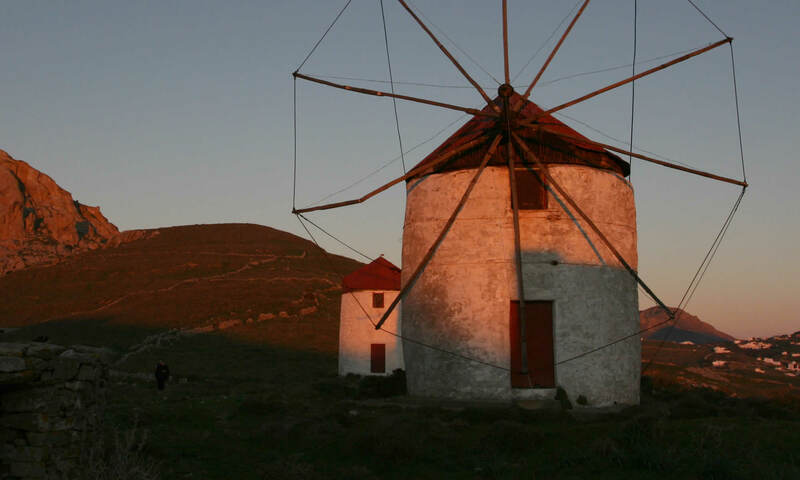 Tinos is the only island of the Cycladic cluster that has managed to keep its traditional character throughout time. It is also the holy island of Orthodoxy with the imposing temple of Megalochari, where thousands of visitors flock all year round. Sightseers call it “The beautiful bride of Cyclades”, because beyond its natural beauty, there is also exceptional Aegean Architecture in its unique villages. Particularly interesting is “Volax” with its lunar like landscape and the strange blocks of stone that are considered to be a unique phenomenon throughout the world. The columbaria in Tinos are unique samples of folk architecture. Even though they can be found in most Cycladic islands, those of Tinos are distinguished for their magnificence and their particular construction. In Tinos there are roughly 1000 columbaria. The oldest ones were built by the Venetians. Most however were built during the 18th and 19th century. The builders of the columbaria, using their imagination and talent, created true works of art, using elaborate designs. Pyrgos(owing its name to a Venetian Tower hidden in the mountains, according to some 16th cent. documents), is the largest village of Tinos. It is 30 km away from the Chora, and is one of the most beautiful villages of the island and one of the most picturesque in the Cycladic cluster. Its beauty, traditional architecture and the authenticity of its landscapes, create a distinctive atmosphere. The white houses of Pyrgos are decorated with marble lintels and steps. Pyrgos was at its height economically and artistically during the 18th, the 19th and the early part of the 20th century, thanks to shipping traffic, trade and, mainly, the marbles of the region. Homeland to many leading (Chalepas, Filippoti, Lytra, Gaiti, Duke of Nikos Skalkota, the composer and others) as well as to others little or not known artists, who uphold the tradition to this day. Giannoylis Chalepas was born in Pyrgos in 1851. He has been acclaimed as one of the most prominent Modern Greek sculptors. The house where he was born has been turned into a museum and there are on display there samples of his work, photographs and personal objects. In the Chora of Tinos there is also the Giannoylis Chalepas museum that houses a great part of his work. The museum of theArtists of Tinos houses a numerous collection of works of local painters and sculptors. The museum houses mostly the works of both old and contemporary sculptors of Tinos. Another intriguing sight is the Cemetery of the village with its ornamented tombstones, whereas the parish churches of Agios Dimitrios and Agios Nikolaos do not fall short of the former. Another place any visitor to the island should visit is the School of Arts, a three year school admitting students from all over Greece. West of the village, about 3km away, lies the picturesque bay of Panormos (where our establishment also is), showing constant tourist growth which has not influenced its traditional character. This place offers visitors the opportunity to enjoy the sea in one of the many beaches (Agia Thallasa, Kavalourko, Rochari), to enjoy good food, as well as to enjoy hiking around the many old paths that exist. All in all, it will cater ideally to the needs of people seeking peace.